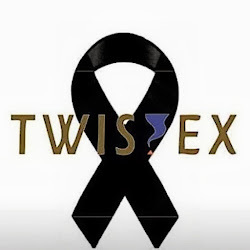 We were under a high risk of severe weather and some of the most influential storm chasers I know were commenting how bad the forecast for Wichita looked. 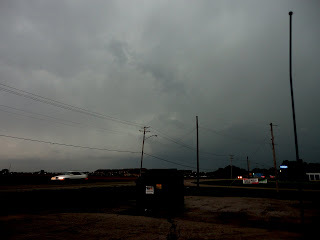 Although it has been a mostly quiet spring, we were due for bad weather, and with Joplin, MO so fresh in our minds, many people including myself were worried. Storms began firing up in Oklahoma west of OKC and heading here fast. Even the management at work released us to go home early. Of course, I went chasing. I hate fast moving storms. These were coming in at 50-60mph and beginning to join into a nasty multicell storm. For this storm I decided to take out the Chevy POS. No point in destroying totally reliable transportation. I grabbed Ruminator Brent again (he was with me on the previous storm posted) and we headed out west to intercept. Right before we left, a cell formed before the multicell and looked interesting. We ran to Maize, Kansas and set up. Once again at Nancy's A-Mazing Sandwiches, sorry Nancy there was a weather apocalypse we had to get ready for, so we stayed in the parking lot. Boosted the shadows in this to show cloud definition now I see an inflow line. While watching very dark, very overcast sky, two bicyclists passed us holding up traffic on one of the main streets in Maize. I think my chase partner and I stared at them as they went by thinking of a case to present on functional Darwinism. Unfortunately dark, overcast, and rainy sky does nothing for photography. We sat in the parking lot watching the storm came in and the lightning gave a show that now I kick myself for not recording. Seemed like we were surrounded by lightning and thunder for a while. We ran back across town to the east side seemingly to get rained on a little harder. Thank you Rain-X. 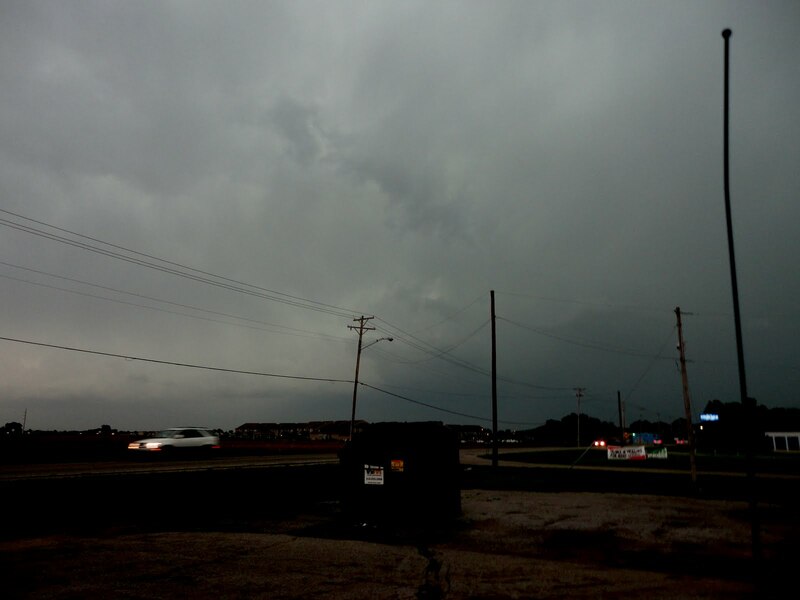 The storms flew through the area and slowed as it hit the city. Reports were coming in about the destruction in OKC and surrounding areas, but Wichita really dodged the bullet. We ran back to the house to check radar (I know I need to upgrade and join this decade, hmmmm maybe I'll add a paypal account for help). The storms in Wichita weakened drastically and a large strong squall line had formed in western Kansas spawning several warnings. As the sun went down, the line decided to start moving east. The bottom of the squall line would hit Wichita and as it grew close, thunderstorm warnings were issued, although they were borderline severe. They appeared to build for a while, then weakened as the sun dipped below the horizon. The winds were still as this moved in then a moderate gust of cold wind let you know it was coming. I tried taking lightning pictures and developed a game called Capture/Processing. When the Sony DSC-V3 is capturing and lightning strikes, I get it. When it's processing, I get nothing. Last night the storm won. After dark I started playing with long exposure as the shelf cloud came into sight. The below was taken with a 5 second shutter speed. The light on the left is from Wichita, the light in the middle was lightning. Not too much on the horizon, yet. I could use a couple days worth of rest.